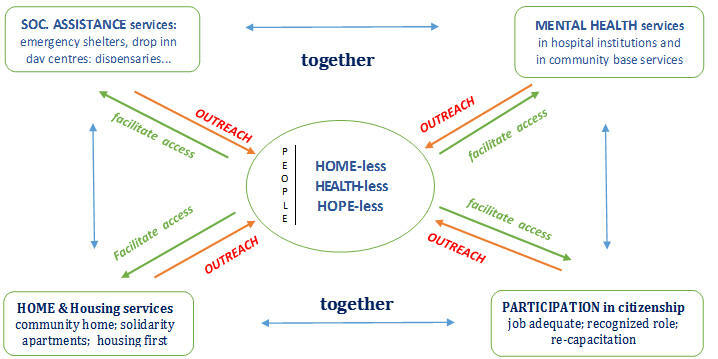 HOW these services contribute in promoting the dignity & well-being of homeless people with mental illness? Preben Brandt : Inside and outside – inclusion or exclusion ? St Mungo's : Our vision is that everyone has a place to call home and can fulfil their hopes and ambitions . Giuseppe Riefolo - Sylvia Raimondi : "Compulsory position in the intervention oh homless patient with severe psychiatric disorder"
"Effects of group psychotherapy on homless population suffering from mental illness"
Ines Figueiredo : "From Norway and the back : a teamwork sucess story defeating schizophrenia and homlessness"
Tom Freundlich : "Caring for homless patient and attachment issue ?" Sérgio Henriques : "The prevalenceof mental disorder among the homless in Lisbon"
Philip Timms : « 25 years of psychiatric services"
Francesc Guasch/Josep Maria Anguera : "Experience with volonteers in shelter and housing first"
"Solidary lockers - an innovative project"
Ines Almas : "Ending homlessnes through Housing First"
Américo Nave : "Resumo : Isto É uma casa - Lisboa Housing First"
Raquel Rebelo "Gestão de caso em utente com esquizofrenia - caso pratico no contexto de populacoa sem abrigo""
Sandrine Rousée - Serre Mariannne"Ciné-débat"